Here are all the things inside your PC. Veteran PC gamers and builders talk inside baseball about their hardware and upgrades all the time, and the results for newcomers are bewildering. What's an ATX power connector? What about a chipset? What's the difference between micro-ATX and mini-ITX? The jargon can be overwhelming. 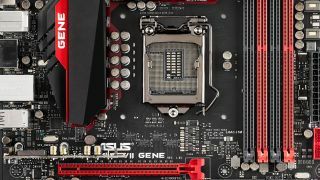 If you're beginner in the PC world or taking a crack at putting together your first rig, there a lot of terminology to know. You could hunt down definitions for each of these words individually as you encounter them, but we’ve gone one step further and grouped all the relevant terms in once place. Moreover, even if you know what a CPU is, do you know what it looks like? That's where the visual part of this guide comes in. In addition to the comprehensive glossary of PC components—mostly hardware, with a few important software definitions—we’ve included images as well, so you can have an at-a-glance reference for everything and know exactly what you're putting into your PC. AHCI – Advanced Host Controller Interface - Older storage protocol standard designed for mechanical hard drives. Air cooling – When heat sinks alone aren’t sufficient to ventilate hot-running electronic components, one or more fans can be used to blow air across the radiator to increase the thermal dissipation of the cooling system. Well-designed air cooling systems are highly cost efficient and quiet, but are less effective for systems that demand the highest levels of performance, especially in small enclosures. Anti-static bag – A specially coated, reflective foil bag that prevents static discharges from damaging uninstalled and unshielded electronic components. Always store expensive computer parts in these. Anti-static wrist band – A wrist strap that prevents static damage while handling components by electrically grounding the wearer. A wise precaution to take when performing system upgrades and maintenance. APU – (Accelerated Processing Unit) AMD’s definition for a CPU/GPU fusion designed for budget and midrange gaming-oriented systems. APUs generally perform better at gaming tasks than corresponding CPUs using standard integrated graphics cores. ATX power connector (20-, 24- and 20+4-pin configurations) – This is the connector that powers the motherboard chipset and onboard controllers. It’s housed in a large 20- or 24-pin Molex connector, often split into a 20+4-pin dual connector configuration. Audio connector panel (analog, S/PDIF, Mic, line in) – The I/O panel on a motherboard typically houses the audio input and output ports, which include an analog headphone jack, a line out, unamplified line in, a Mic connector and digital S/PDIF connections. Note that some mics use USB connectors now. BIOS (Basic input/output system, also Firmware, also UEFI) – The Basic Input and Output System or BIOS is the low-level operating system of a component such as a motherboard or graphics card, often made user accessible via a set of option screens that are exposed to configuration at boot time. Later BIOS specifications include the UEFI standard, which allows for more flexibility in underlying architectures and device configuration. BGA socket (Ball grid array socket) – These sockets, used by Intel for all their upgradable CPUs such as the Core i5 and i7, differ significantly from the classic PGA design where a processor with pins slips into a socket with a matching grid of holes. On BGA CPUs, the processor has no pins at all, and instead uses a series of flat metal patches that contact a matching grid of tiny rounded spring tips housed in the motherboard socket. This makes for a much less fragile processor design but moving the more delicate parts onto the socket itself means care needs to be taken when handling the motherboard if the protective plastic socket cover is removed. Those in-socket spring tips are hard to fix. Case – The chassis of a PC where all internal components are mounted is commonly referred to as the case. These come in a variety of standard sizes including tower and desktop configurations. Some cases are designed to be worked on without tools, using brackets, drive rails and other screw-free fastening techniques to enhance ease of access. Cases have also become fashion statements, and are frequently carefully painted, windowed and lit to showcase the components and craft used to build the systems they house, a hobby known as Case modding. Chipset – Motherboards manage their functions with a series of integrated circuits collectively known as the chipset. The chipset’s specifications determine many aspects of a system’s performance, including memory support, overclocking potential, expansion capabilities and CPU compatibility. High-performance components, such as unlocked processors, often require premium chipsets to function at maximum speed. Example chipsets include Z370 and Z390 series from Intel and X470 from AMD. CMOS (Complimentary Metal-Oxide Semiconductor) – CMOS is the technology used to create most chips used in personal computers, as well as image sensors and analog circuitry. CMOS designs are naturally heat efficient and resistant to electronic static interference. Colloquially, CMOS is often used to refer to the CMOS battery on a motherboard, which saves the motherboard's settings in memory. Removing the CMOS battery can reset the motherboard to defaults. Core – The computational center of a processor, usually one of group of up to six in a modern desktop CPU, although high end parts can feature up to 18 cores. Large core counts can improve performance in highly parallel workloads such as rendering but can limit clockspeed and thus IPC performance for low-core count workloads such as games, which usually prefer clockspeed over core count. CPU (Central processing unit) – The CPU or Central Processing Unit is the primary computational engine of a PC. Modern CPUs are divided into cores, typically 2, 4, 6 or 8, which largely function as separate processors and allow the computer to perform multiple tasks (called threads) concurrently. Some Intel CPUs employ a process called hyperthreading, which doubles the apparent core count by creating virtual cores which can be assigned tasks in the same fashion as an actual core, increasing the efficiency of highly parallel workloads. AMD counters this feature by providing more hardware CPU cores, up to 8, in select CPU offerings. Current CPU designs also absorb functions previously relegated to external devices, such as floating-point computation, memory control and most recently, graphics. While most CPUs are locked to specific operating frequencies, enthusiast variants such as Intel’s K series are open to overclocking. CPU mounting plate – The growth in size of heat sinks and cooling systems necessitated the addition of a reinforcing back plate to motherboards to prevent damage during assembly, especially when mounted vertically in a tower case. Mounting plates typically attach on the rear side of the motherboard and allow large radiators and fan assemblies to be securely fastened without flexing the area around the CPU socket. CPU power header – The CPU power header is a socket that accepts an 8-pin EPS power cable and frequently an additional 4-pin ATX power cable to supply the nearby CPU with the wattage it needs for operation. CPU socket – This is where the CPU is secured on the motherboard, usually via a lever arm and a series of fastening screws or clips. Current consumer desktop sockets for Intel include LGA1151 and LGA2066 for Intel processors while AMD sockets use AM4 for Ryzen. Sockets are notched to insure chips are inserted in the proper orientation. Crossfire – Two or more AMD graphics cards used in tandem to increase 3D and computational performance for high-demand applications such as high-resolution 3D gaming. For best results, Crossfired cards should be as close to identical in performance and design as possible. Drawbacks include high power use, compatibility issues with some games, occasional driver glitches and non-linear performance scaling. DDR RAM – Double data rate synchronous dynamic random-access memory. See DRAM module for more. Desktop case – Desktop cases orient the motherboard horizontally and favor smaller form factors. This design is most common in media centers, office PCs and low-powered systems. These cases are often designed to sit beneath a monitor or in a home entertainment system rack. Especially thin desktop cases are referred to as pizza box cases. DisplayPort connector – DisplayPort is a high-performance digital video connector designed to overcome some of HDMI’s shortcomings as a computer display connector. DisplayPort is physically smaller, allows for higher resolution, improved refresh rates, and permits features like daisy chaining multiple displays. DisplayPort 1.2 natively supports 3,840×2,160 at 60Hz and was one of the first widely available display technologies to be able to do so. DRAM module – Dynamic Read Access Memory modules populate the memory bank slots on most motherboards and provide the host computer with an addressable space to store and manipulate computational results. Unlike Static RAM (SRAM) DRAM requires periodic electrical refresh to maintain stored values and is wiped clean when a system is shut off or rebooted. DRAM modules come in several packages and speeds, the most popular being Dual Inline Memory Modules (DIMMs) for desktop DDR3/DDR4 applications and the smaller sized SO-DIMMs used in laptops. Current Coffee Lake systems are now using DDR4 RAM with 2666 MHz default speeds, although modules over 4 GHz are available. Extremely high-speed DRAM modules suffer from longer access latency, so a balance of speed and latency values are often needed for best combined performance. Furthermore, multichannel memory implementations should be installed as directed in groups for optimal speed. Dual-channel memory, for example, should be installed in matched pairs. Most kits come pre-matched with the appropriate number of DRAM modules already included. Mixing DRAM is a recipe for disaster, even the same models and speeds. Stick with factory matched modules to insure stability. Drive bay – Expansion areas in a case or chassis that accept various data drives or other devices. Standard bay sizes are 5.25" (optical), 3.5" (mechanical hard drive) and 2.5" (mobile or SSD) in full- and half-height varieties. Most feature cut-out front panels that can be removed for external access or accessories like hot-swappable drives or advanced audio control panels. DVI connector (DVI-I, DVI-D, DVI-A, single and dual link) – Digital Video Interface connectors were the first widely available upgrade from analog VGA and are still in wide use, despite being superseded by the smaller, more efficient DisplayPort standard in 2008. DVI includes specifications for digital (DVI-D), analog (DVD-A) and mixed (DVI-I) signals in single and dual link connections, each with a different pin configuration in the same, large D-sub package. Maximum resolutions for DVI are 1920x1600 for single link, 2560x1600 for dual link and 1920x1200 in analog, all at 60Hz. Unlike HDMI and DisplayPort, DVI connectors do not carry an audio signal. Ethernet – Ethernet is a wired local area networking protocol designed for compatibility and speed. Around since 1973, Ethernet has been revised many times and remains the de facto wired network protocol for office and home use. Ethernet uses RJ-45 connectors, which resemble telephone jacks but are slightly larger in size, and is carried over cabling rated by categories for speed. Ethernet is commonly deployed in 10BASE-T for 10 Mbit/s, 100BASE-T for 100 Mbit/s and 1000BASE-T for 1000 Mbit/s, the latter commonly referred to as Gigabit Ethernet. Ethernet is recommended for low latency, high-speed games that are played over a network or the internet. Gigabit Ethernet requires category 6 cables for full speed operation. GDDR – Graphics Random Access Memory, the RAM used in modern graphics cards. The current standard is GDDR6, as implemented in Nvidia’s GeForce 2080 and 2070 series. GPU (Graphics processing unit) – Often used interchangeably with 'graphics card,' GPU refers specifically to the chip that controls the graphics subsystem. The GPU is the primary determining factor in gaming performance and the most demanding component in terms of power and bandwidth, which is why advanced designs require dedicated banks of high-speed specialized memory and multiple power connectors. Graphics card – While modern CPUs come equipped with fairly potent on-board graphics capabilities, most 3D games benefit from a discrete GPU with its own dedicated bank of high-speed memory attached via PCI-E on a graphics card. Even low-end graphics cards offer several times the performance of CPU integrated video, and many demanding games require midrange or better cards for acceptable performance. Power draw on top-shelf graphics cards easily outpaces all the other components of a system combined. Heat spreader – The metal cap covering the processor internals in a CPU package. Enthusiast seeking the ultimate in overclocking performance remove these caps in a process called “Delidding” that allows specialty coolers direct contact with the processor, eliminating the lid “middle-man” and replacing the default thermal interface material used by Intel with more exotic compounds. Delidded CPUs are more fragile than normal processors, and the process voids all warranties. Hot swap – Less spicy than it sounds. Hot swappable components are ones that can be removed or installed without powering off the computer first. Generally reserved for the enterprise market to avoid downtime and simplify service. HD Audio/AC 97 – AC97 and HD Audio are sound codecs created by Intel to provide an audio standard for motherboards, modems and sound cards. Comprised of a hardware controller and analog codec, AC97 provides 16- or 20-bit audio at sampling rates of 96kHz for stereo and 48kHz for multichannel use. HD Audio was Intel’s 2004 successor to AC97 and provides for more channels, although it is not backwards compatible. Most systems not employed in professional audio applications use AC 97/HD Audio for sound output. HDMI connector – A flat, D-shaped connector for digital video that is compatible with HD televisions. HDMI is designed to carry audio, and later revisions can also carry a network signal. HDMI 2.1 currently supports resolutions up to 10K at 120Hz, Dynamic HDR and variable refresh rates. Header – A set of pins on a logic board that can be opened or closed with a jumper or ribbon cable for configuration, input or output purposes. These are often grouped by function, such as audio or USB. Heat sink/Radiator – A series of metal fins mounted on a plate designed to conduct heat away from components so they remain within recommended temperature limits and avoid thermal performance throttling or physical damage. Heat sinks are usually mounted with thermal paste and secured with screws or a fastener. They can be passively cooled by ambient air or actively cooled via air or water in more demanding situations. iGPU (Integrated GPU) – Modern CPU designs generally include on-board graphics controllers that provide low to midrange performance suitable for office applications, video playback and light gaming. Since integrated GPUs use system memory and share resources with the host CPU, always use the fastest compatible DRAM configuration for best performance. I/O plate – A panel designed to be mounted over a motherboard’s bare, rear-facing external Input/Output ports via a standard sized cut-out hole on the back of the case. The panel is usually labelled and color coded to provide ease of access to the various ports. Careful, these like to bite during installation. ITX (Mini-ITX, Nano-ITC, Pico ITX) – A common small motherboard form factor family ranging between the size of a softcover book and a deck of cards. This form factor is popular with boutique builders, media center enthusiasts and DYI hobbyists but offers limited performance potential and higher component costs. Jumper – A plastic cap with an internal metal connector that creates an electrical contact between two header pins on a logic board. Jumpers are used to hard set configuration options. They are usually labelled. LAN/Ethernet RJ45 jack – This square connector port accepts RJ45-style network cables to hardwire a computer to a network. Cabled Ethernet offers best experience and lowest latencies currently available to most gamers. LED case illumination – Cases, fans and other components are often provided with illumination that serves both a functional and artistic purpose. These low-power LEDs often come color coordinated to match component designs, indicate a product family or just provide a custom touch to a handmade build. In addition to style, they provide a means to visually inspect the system internals to make sure vents, fans, cables and other components are operating properly. Some are attached to a voltage controller, and vary lighting intensity to indicate usage levels, fan speeds or other information. M.2 – Currently popular with gaming rig builders for storage, M.2 drives not only feature minuscule size but offer blistering 2-3 GB/s performance. Looking more like DRAM than old-school hard disks, M.2 drives mount either on specialized motherboard slots or PCI-E expansion cards. Unlike their larger counterparts, M.2 drives run quite hot, and often require additional cooling when used in confined spaces. M.2 slots are also frequently used for components such as miniature Wi-Fi cards. Mechanical hard drive – These storage devices utilize rotating magnetic disks to store data and generally feature lower costs and larger capacities than solid state drives. While mechanical hard disk systems are a mature and stable technology, SSDs have recently begun to supplant them. The faster the rotational speed of the disk, the better the performance and the higher the cost of the drive. 5400 RPM disks are considered mainstream, while 7200 and 10,000 RPM speeds are reserved for high-performance drives. Memory reset switch – A motherboard safeguard panic button that resets memory specifications to a factory-predetermined safe value that ensures boot up in case a user sets incorrect or optimistic values while configuring BIOS settings for DRAM. Memory is especially picky about settings and recovery, so this is a handy option to have. Molex power connector – Molex connectors are the common term for the two-piece, rectangular pin and socket power connectors used in personal computers. These come in a variety of configurations, including standard 4-pin for data drives and 20-/24-pin for ATX motherboard power sockets. Molex connectors predate personal computers and have been around since the late 1950’s. Motherboard – It all starts here. The motherboard is the foundation of all personal computers and the place where your components meet. Motherboards host the CPU, DRAM, data drives and any add-in cards via a variety of slots, sockets and connectors. Modern motherboards are also fashion statements, adorned with color schemes, logos and artfully sculpted metal covers and heat sinks. MU-MIMO Wi-Fi – Multi-user, multiple-input, multiple-output Wi-Fi (MU-MIMO), also known as AC Wave 2, improves network performance by creating separate streams that can be accessed simultaneously. This is particularly effective in situations when many devices are accessing a wireless router simultaneously. Many newer motherboards, laptops and wireless devices support this standard. Mounting/Drive rails – Some case designs utilize a system of rails and clip-in channels to mount internal and external drives into place. These systems often do not require the use of tools or even screws and offer ease of access and maintenance benefits, although replacing custom rails or other non-standard fastening equipment might be troublesome should these specialized parts be lost. Storing rails inside the case on empty drive bay brackets always keeps a few handy. mSATA – Mini-SATA or mSATA devices are small-footprint SSDs designed for smaller chassis and mobile PCs. Don’t get confused and try the edge connector in a mini-card PCI-E slot; they look alike but aren’t compatible. mSATA connects via a specific internal ribbon cable to the SATA host controller. OEM (Original equipment manufacturer) – Often refers to inexpensive parts obtained directly from a source supplier rather than after markup, post rebranding and retail. Not all OEM parts are equal however, so buyer beware. Open case (Open air case, bench case) – Open air cases are designed to mount PC hardware in high visibility or easy access situations, such as a testing bench or custom build meant for display. Most are comprised of a tray that displays the motherboard and PCI cards but stashes the power supply and drives in small, open compartments underneath. Frequently used by overlocking enthusiasts, open air cases allow easy access to components and provide excellent ventilation while showing off the details of a fancy build. Keep away from pets, small children and open containers, and watch out for dust buildup. Optical drive – Largely obsolete, 5.25” optical disc drives such a CD-Rs, DVD-Rs and Blu-ray rewriters are still used for legacy installations, media conversion and other retro situations. Stick with faster and more reliable USB drives when possible. OS (Operating system) – The OS is a software layer that runs above the BIOS and provides the environment required for applications to operate. Most gaming systems run a recent version of Microsoft’s Windows for performance and compatibility reasons although both Linux and the MacOS provide alternatives. Don’t forget to factor the cost of the OS with your build if you don’t have a handy license. Overclocking – Pushing a component beyond its rated specifications to achieve more performance, usually achieved via BIOS settings or manufacturer software utilities. Overclocked systems frequently outperform stock parts by a considerable margin with the drawback of noticeably greater heat and energy use. Overlocking may lead to premature component failure or void warranties. PCIe (PCI Express) – The Peripheral Connect Interface Express bus is a high-speed expansion slot designed to accept add-in components such as graphics cards. PCIe replaced the older PCI, VESA and PCI-X expansion designs in 2004 and is available in several speed ratings and connector sizes, ranging from tiny 1x slots to large 16x slots. PCIe connectors are designed to be downward compatible, so smaller cards can fit in larger sized, high-performance slots if necessary. Data in the PCIe specification is transmitted via lanes, of which up to 32 can be used in a single slot, although 16 is the more common limit. When configuring a system with multiple, high-performance PCIe cards, such as graphics cards in Crossfire or SLI, make sure to select a motherboard with enough PCIe lanes to provide the bandwidth required, as the physical size of the slot does not always correspond to the number of rails available to the PCIe bus. PGA socket (Pin grid array socket) – A socket for processors that have pins instead of contact pads on the underside, such as AMD’s Ryzen CPU series. A processor is installed by slipping the pins into their corresponding holes in the socket and secured with a lever that tucks under a clip. A corner marking and hole pattern that only allows proper insertion are frequently present to ease the installation process. Advantages over the BGA sockets used by Intel include a more robust socket design and more secure mounting, with the drawback being a more fragile CPU package, as the underside pins are prone to bending if mishandled. Pinout – A diagram specifying what each of the pins on a header is used for. Frequently found silkscreened on motherboards or in hardware manuals. PCI expansion cards – In addition to graphics cards, PCI expansion cards are available for other functions to supplement the built-in capabilities of the motherboard. Examples include sound cards, high-speed network adaptors and advanced fan controllers. PCI express power cable (6-, 8- and 6+2-pin configurations) – These power cables supply high-performance PCI Express components, typically graphics cards, with the supplemental power they require for full performance. These come packaged in 6-, 8- and 6+2-pin configurations, and high-end graphics cards typically use more than one. PSU (Power supply unit) – PSUs provide a motherboard and components with the power needed for stable operation. This is delivered via a series of cables either permanently attached to the power supply or plugged in on a per-use basis on high-end modular models, which feature sockets on the PSU so extraneous connectors can be removed to reduce chassis clutter and improve airflow characteristics. Computer power supply units are designed around several size and output standards and are rated for wattage and efficiency using the voluntary 80 PLUS certification program. Stick with 80 Plus Silver or better PSUs for best results. Radiator – A fluid filled heat dissipation unit used by water cooling systems. Generally considered more effective than air cooling. SATA (Serial ATA) – SATA is a bus interface standard used for storage devices such as hard drives, SSDs and DVD recorders. SATA devices encompass a family of interfaces separated by connector size and performance potential. The original specification is over a decade old and featured real world transfer rates of 150 MB/s (1.2 Gbit/s), but later revisions have raised that to 600 MB/s (4.8 Gbit/s) and beyond. SATA cable – A flat, powered ribbon cable used to attach SATA storage devices to the host controller. SATA cables differ depending on the size specification and drive type. SD card reader – A built-in slot or drive bay component designed to read Secure Digital (SD), MiniSD and MicroSD nonvolatile memory cards popularly used with mobile devices. SLI – Two or more Nvidia graphics cards used in tandem to increase 3D and computational performance for high-demand applications such as high-resolution 3D gaming. For best results, SLI-joined cards should be as close to identical in performance and design as possible. Drawbacks include high power use, compatibility issues with some games, occasional driver glitches and non-linear performance scaling. Not recommend by most manufacturers at this time. Standoff screws – These small brass riser screws are tapped and threaded at the cap and used to secure the motherboard to the backplane of the case. They also keep the underside of the motherboard from contacting the chassis and shorting out. Always have spares, because you can’t finish a build without them. Thermal pads – Thermal pads are a form of TIM (see below) that come prepackaged in adhesive strips that mount quickly and easily, like double-stick tape. They are less efficient than proper thermal paste but are useful for less demanding applications, such as motherboard chipsets and DRAM cooling. Thermal paste/Thermal interface material (TIM) – Thermal paste is a viscous, heat-transferable material used between a heat sink and the lid of a chip to increase the efficiency of a cooling system. When used sparingly it ensures both surfaces remain in full contact despite any micro scratches or other imperfections that would prevent heat dissipation. Use gloves when applying as this stuff stains everything. Clean off surfaces with high grade alcohol. Thermal throttling – When modern electronic components reach thermal limits they begin to reduce speed and features in an effort to retain stability and prevent damage, a process called thermal throttling. While throttling can protect components against sudden surges in heat, it’s not designed to supplant proper component cooling. Throttling usually indicates a thermal management system failure or insufficient cooling capacity. Thumbscrews – Thumbscrews are chassis screws designed to be used without a screwdriver. These screws have large, knurled edges made to be twisted loose or tightened by hand. These are usually employed on the main access panel to secure add-in PCI cards to the chassis backplane. Tower case – Tower cases orient the motherboard vertically and are generally designed to rest underneath a desk. Mid- and full-sized towers are the most common configurations, and the design’s natural cooling and access advantages favor high-performance systems. Most gaming systems reside in tower cases. Tradeoffs include increased size and weight. UEFI – Unified Extensible Firmware Interface. A modern replacement for the BIOS. See BIOS for more. USB connectors – USB connectors are typically labeled for speed and usage type on motherboards and serve several different purposes. USB 3.0 ports (colored blue) are generally reserved for high-speed data usage and quick recharging duties while 2.0 ports (colored black) are used for low-speed peripherals such as keyboards and mice. Many motherboards also include a specially designated USB port used for BIOS and firmware upgrades, loaded via thumb drive. The new USB 3.1 (colored red) specification increases data speeds and introduces a smaller, reversible, easy to attach connector. USB motherboard header – The group of pins is used to connect external USB case ports to the motherboard via a ribbon cable supplied with the chassis. Pictured: the larger USB 3 motherboard header. VESA mount – A mounting standard used for flat panel displays and monitor stands that specifies an arrangement of four screw holes on a flat, square surface suitable for attaching components that follow VESA guidelines. VESA mounts are also used to mount small form factor cases and other equipment. VGA connector – Old style analog D-sub VGA is still handy to connect with aging projectors or other specialty equipment, but is generally relegated to compatibility or backup status since digital display connectors offer better quality and more features. VRM – (voltage regulation module) Voltage regulation modules control the distribution and quality of power signals to the components mounted on a motherboard and are crucial to overclocking performance and stability. Water cooling – Water cooling is generally reserved for the highest performance applications, and the best implementations offers superior heat dissipation along with the advantage of a radiator that doesn’t have to sit directly on top of a CPU or GPU. Off-the-shelf models, referred to as CLCs or Closed Loop Coolers, are designed to be as easy to install as air-cooled units but are less user serviceable or customizable. Custom system builders prefer open loop coolers as they offer the highest cooling potential but require additional periodic maintenance and upfront expense. Wi-Fi (WLAN) – Wi-Fi refers to a wireless local area network using the 802.11 standard over a 2.5 or 5 GHz radio band. Wi-Fi comes in several variants, such as 802.11n (40 Mbit/s) and 802.11ac (160 Mbit/s). While useful for laptops, tablets and mobile devices, desktop PCs usually benefit from much faster and lower latency wired Ethernet connections. New standards include 802.11ax which incorporates MU-MIMU (See entry in this guide) and other technologies to boost bandwidth and improve multi device network performance. Wi-Fi antenna – A short, usually plastic coated antenna that attaches via co-ax connector to a Wi-Fi adaptor to increase range and reception quality. XMP – (Extreme Memory Profile) An Intel derived DRAM settings standard that provides several fail-safe memory configurations beyond the default setting, allowing easy configuration of high-speed memory modules.